Welcome to Highland Homestead! This original homestead cabin, built in 1910, has been renovated from top to bottom, with specific attention placed on detail and decor to preserve its period quaintness. 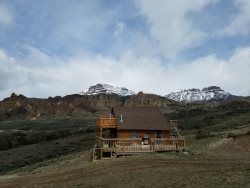 Situated approximately halfway between Yellowstone National Park and Cody, Wyoming, this cabin sits in the heart of the breathtaking Wapiti Valley. It provides access to 42 private acres with Shoshone River frontage, 360 degree Absaroka Mountain views and wildlife in abundance. Step out the front door and go hiking, fishing, read on the porch, drink in the beauty of the mountains, play games on over 2 acres of lawn or just roast marshmallows by the fire. Go horseback riding, rock climbing, rafting, zip lining or boating on the lake nearby. Its a 20 minute drive to the world class Buffalo Bill Center of the West and the historic Cody Nite Rodeo and numerous other attractions. Use the homestead as your home base while you enjoy Yellowstone, a mere 30 minute drive away. Dining, shopping and entertainment are also in close proximity. Open your windows at night, feel the cool mountain breeze, gaze at the stars and fall asleep to the sound of the river. Escape to the peace and tranquility of Highland Homestead. For larger groups, the Highland Bunkhouse can be rented with Highland Homestead. Contact the office for more information and special rates. NOTE: This property does not have A/C. Average temperatures in the summer are low 80's in the day and low 50's at night. We could live in the 1910 cabin!!! It was beautiful! Every thing was great except for the water had a sulfur smell that was hard to ignore. The view was great. The road to cabin was very rough. Absolutely adored your cabin, It is beautifully restored and a wonderful piece of history, We love all the as well, My favorite thin about staying here was being able to walk around the property and admire the spectacular views. Thanks for sharing & preserving this historical place. We loved your 1910 cabin! Such an incredible view to wake up to every morning, Thoroughly enjoyed being away from all the world in your little corner of the world. Fantastic vacation in this cozy rustic cabin with all the modern conveniences. Gorgeous views from every window and the front porch for great relaxation. We loved staying in this place and if we return to the area again, we will definitely stay there again. thank you for contributing positively to our wonderful vacation. We loved staying here at the "Homestead" the cabin is wonderful and the view out the windows and the porch is spectacular. We appreciated the decorative touches, from the chaps and native american bead work items to the furniture and fixtures. This is a cozy comfy cottage in a gorgeous setting that clearly reflects the love and attention the hosts have put into it. The attention to detail, amazing view, perfect decor and excellent setting next to the river - and far from the road - made for a welcome home during our visit. We are so glad we chose the Highland Homestead and are already planning our return. The team was supportive, informed, friendly and efficient. Highland Homestead was the ideal location for our 25th anniversary celebration. We couldn't have picked a more perfect location for our getaway! The cabin is absolutely beautiful with everything a couple would need. There's plenty of space, it's beautifully furnished with antiques and modern amenities, and you really feel like you're staying at a western ranch. The views from the front porch and the whole property are spectacular with the well-maintained grounds, the river and hayfields below, and the rugged desert, pine-forested, and snow-capped mountains all around. This is an amazing property and we will definitely be back!